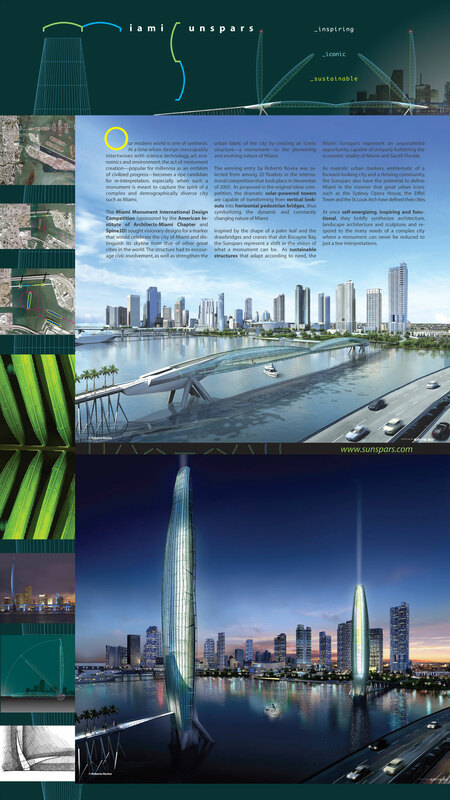 The 2005 Miami Miami Monument Design Competition sought visionary designs for a marker that would celebrate the city of Miami and distinguish its skyline from that of other great cities in the world. The structure had to encourage civic involvement, as well as strengthen the urban fabric of Miami by creating an iconic structure—a monument—to the pioneering and evolving nature of Miami. The competition was sponsored by the American Institute of Architects-Miami Chapter and Spine3D. The Miami Sunspars project by Roberto Rovira won first place in the international competition. The proposal consists of two solar-powered towers capable of transforming from horizontal pedestrian bridges into dramatic vertical lookouts. Visible from both land & sea, they symbolize the dynamic nature of Miami by creating a monument that prominently defines the city’s urban profile and doubles as a functional pedestrian network and destination. 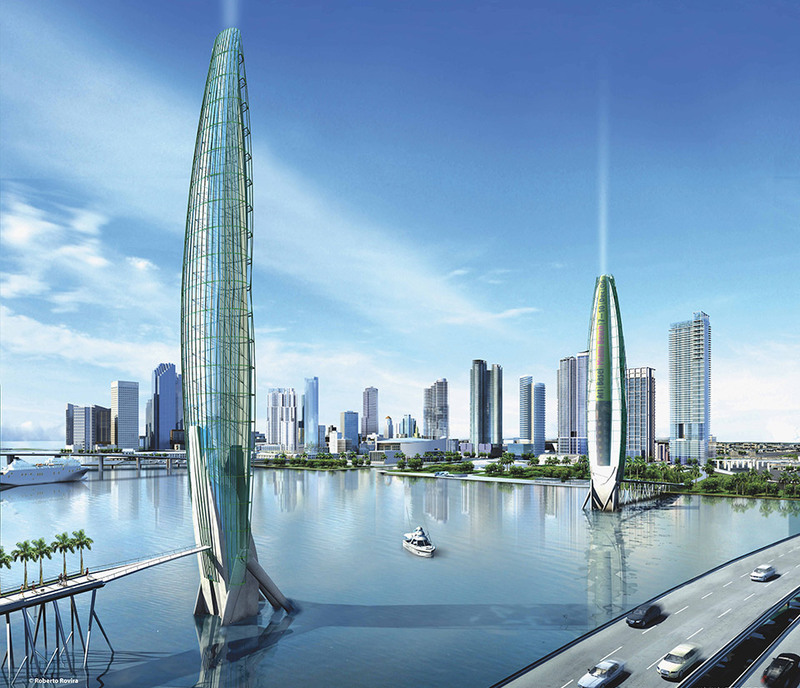 The sunspars re-interpret the concept of a contemporary monument as a dynamic, sustainable structure. By connecting Miami’s Museum Park (currently Bicentennial Park) to Watson Island, they provide a vital pedestrian link between the future homes of the Miami Art Museum (MAM), the Museum of Science & Planetarium, and the existing Miami Children’s Museum, Parrot Jungle Island, and the future location of Island Gardens marina. Metronomic in the frequency with which they change from horizontal bridges during the day to vertical towers at night, they also broadcast a steady stream of information on Miami’s weather, events and people via a digital Media Mesh on the sunspars’ surface. 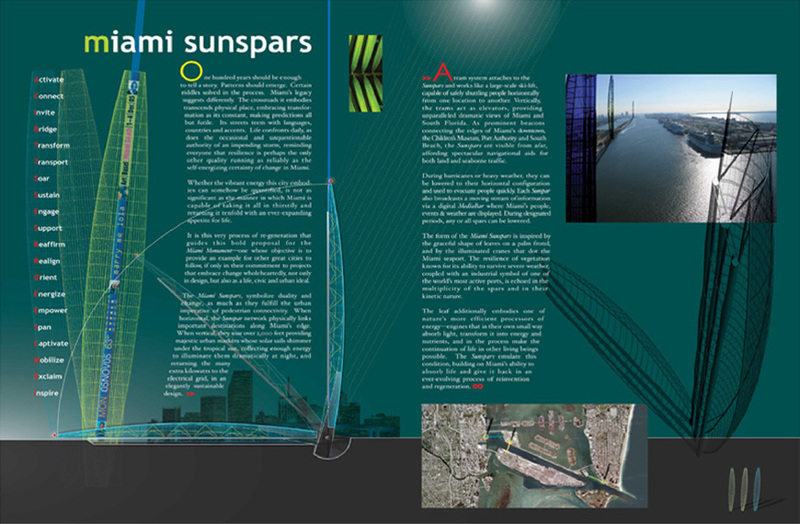 The Sunspars project was subsequently featured in Design Book Magazine, Univision, El Nuevo Herald newspaper, and National AIA Magazine among others (2005-2008).